Test Research, Inc (TRI) in partnership with TRI UK provides solutions for inspection and quality at each stage of the SMT/PCB production line. 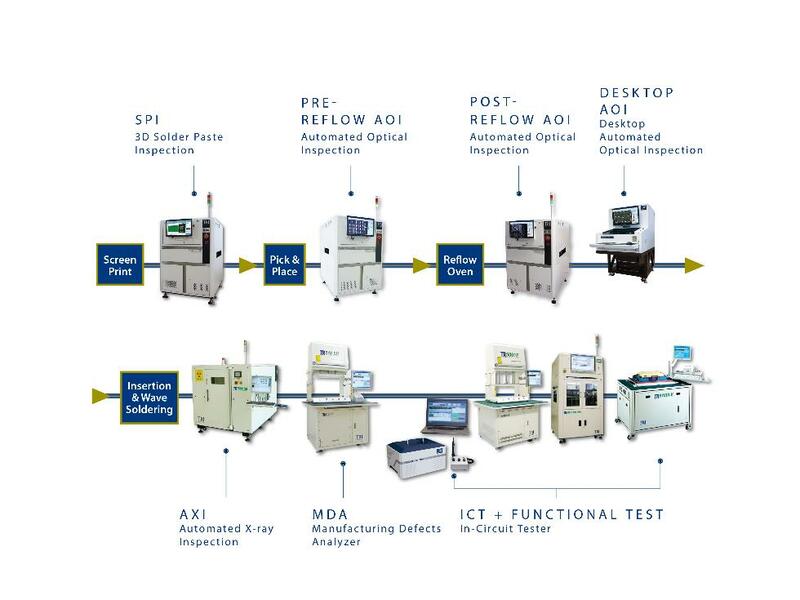 These solutions include Solder Paste Inspection (SPI), Automated Optical Inspection (AOI), Automated X-Ray Inspection (AXI), Manufacturing Defect Analysers and In-Circuit Testers. TRI earned ISO 9001 certification in 1995 and was listed on the Taiwan Stock Exchange in 2002. They currently have a majority market share in Taiwan and China. Many TRI products have been awarded with the Taiwan Symbol of Excellence and the company has gained recognition and acceptance by major international brands and other world-class companies. Presently, TRI has more than 700 employees and has established offices in the USA, Malaysia, Mainland China, Germany, Japan and Korea, in partnership with over 30 distributors worldwide. For the US and the rest of the world, TRI provides not only the PCBA testing and inspection product itself, but also includes on-site installation by TRI’s highly trained and experienced Field Application Engineers (FAEs), testing and validation to meet customers’ satisfaction and after sales services. The after sales service offered by TRI includes but is not limited to: Troubleshooting, Failure Analysis, Periodic Calibration, System Maintenance, and Parts & Accessories Warranty. All the after sales services are provided by TRI’s subsidiaries and authorized distributors in US, Europe, China and South Asia. Test Repair Inspection UK co-ordinates all during-and-after-sales servicing for the United Kingdom and Ireland.